The GIMA series digital panel meter measures values by replacing ammeters, voltmeters, switches, power factor, kW indicators & kWh meters. The Simpson GIMA series provides a single source of instrumentation for all measurement and metering requirements. The GIMA series offers accurate, high-speed, continuous measurements irrespective of harmonics and waveform interruptions. 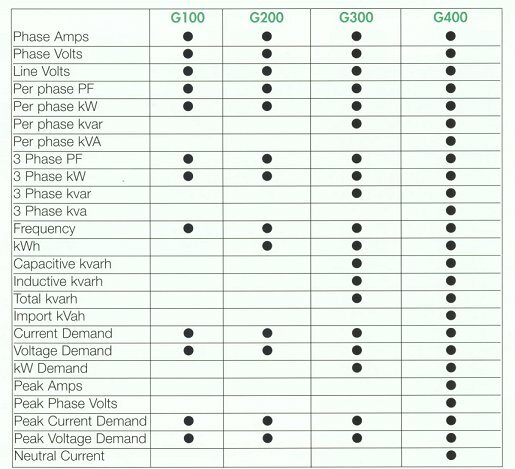 Each GIMA unit can be used as a single-phase or a three-phase meter. These meters feature "Auto-Commissioning" to ensure that a reverse current transformer connection will not cause reading errors. Per phase kW and Power Factor allow a cross-phase connection error to be quickly and easily detected. The GIMA series can also be tested at minimal loads. This is possible by the full four-digit resolution of single-phase values and five-digit resolution of three-phase values. 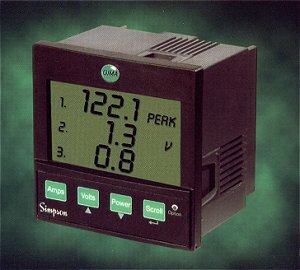 The GIMA series meters off maximum visibility with a custom backlit LCD display. The display is fully visible under most conditions and from most angles. Clear display legends ensure simple readings with no multipliers required. To provide more value to this series, Simpson is offering a range of accessories such as serial communications, analog outputs and three-phase current transformers. Some of these accessories are retro-fit options. With the additions of these accessories, the GIMA series is able to fit within most applications. The MODBUS� Communications Options Module for the GIMA Series adds multi-drop serial communications to any standard GIMA meter. The device uses a high speed microprocessor to extract information from the meter and interface to an industry standard MODBUS� system. Use of a dedicated communications processor ensures optimum efficiency, allowing fast access to data on systems with multiple meters. At 19200 baud, it is possible to access and download the main instantaneous data tables (24 values) from 10 GIMA meters in one second. The use of MODBUS� protocol ensures compatibility with existing systems and/or many readily available software packages. 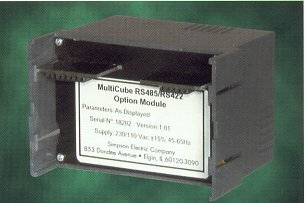 This Options Module may configured as RS485 or RS422 providing 2 or 4-wire communicatins over distances up to 3/4 mile. Data rates of 4800, 9600 or 19200 baud may be selected to suit system requirements. TX Drive RS422 / RS485 4/2 wires + OV. MODBUS� RTU with 16 bit CRC.